4 What Do Downy Woodpeckers Eat? Like all woodpeckers a member of the Picidae family, the Downy Woodpecker is an energetic and beautiful little bird. It looks very similar to the Hairy Woodpecker but is smaller. Indeed, it has the distinction of being North America’s smallest woodpecker, although there are smaller woodpeckers to be found in other parts of the world. The Downy Woodpecker is between five and a half to seven inches tall, which makes it a couple of inches shorter than the Hairy Woodpecker. It’s wingspan is between ten to twelve inches. In terms of identification, the Downy Woodpecker is quite easy to recognise. It has white spots on its shiny black wings. In addition, it also has a white back and you’ll notice red on the back side of the neck on male Downy Woodpeckers. Females don’t have any red on the back of their neck. Another salient feature is the unique face with a striped color combination of black and white. The Downy Woodpecker is found mainly in North America. As the name of the bird suggests, its main habitat is woodland. You’ll find Downy Woodpeckers in orchards, forests, parks and other such places. You’ll also find them in more urban areas where they’re common visitors to backyard feeders. There are basically two main types of Downy Woodpecker call. The first one is made during the breeding season. This is a whinnying call which can be made by both male members and female members and lasts for a couple of seconds, getting lower in pitch towards the end. If a Downy Woodpecker is excited then they’ll likely make a pitch note which is quite sharp. This note is often repeated several times. Downy Woodpeckers aren’t songbirds but they will drum against trees or other wood (and even metal) instead. This is often mistakenly confused with the woodpecker feeding but this isn’t true; they actually feed very quietly. 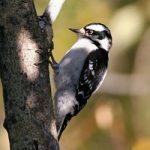 What Do Downy Woodpeckers Eat? Since they naturally live in woodlands and forests, the Downy Woodpecker’s main diet is insects that can be found in the wild and on trees, especially beetles and ants, although they also eat caterpillars and other insects too. It’s also not uncommon for them to eat different sorts of seeds and berries. In terms of searching for food, male Downy Woodpeckers are normally found on the higher branches of a tree. On the other hand, female Downy Woodpecker normally prefer lower branches. The Downy Woodpecker demonstrates great acrobatic ability when it comes to feeding and will often be found on small twigs, even hanging upside down. In addition to eating bugs, they also peck tree trunks and branches which helps them get to the wood insects. They’ll also quite happily eat suet from your feeders. 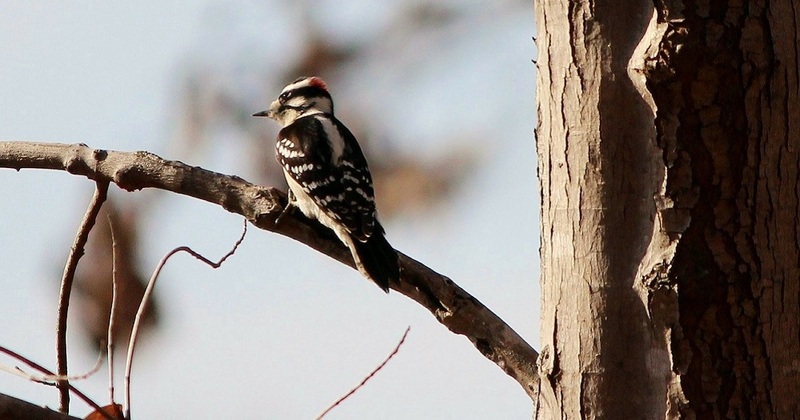 Downy Woodpeckers actually add a lot of value to our ecosystem. By getting rid of the harmful insects, they actually protect trees and prolong their lives. The male and female Downy Woodpecker feed separately during fall and on into the first part of winter. In late winter, they’ll come together as a pair. They do this by each drumming on wood in their own feeding territory. The male woodpecker will then slowly approach the female and they’ll form their pair. Together they’ll excavate a cavity in a dead tree or dead branch of a tree, and they’ll use this cavity as a nesting area. They’ll often place lichen or fungus around the entrance to the cavity in order to disguise it. During the mating season, a Downy Woodpecker pair will produce between three and six eggs, but most often four or five. There’s usually only one brood produced per mating season, but sometimes two will be produced further south. Both the male and the female take part in the incubation period which lasts for twelve days. Both sexes will then also be involved in feeding the young by bringing them insects in their bills. The baby Downy Woodpeckers will start to leave the nest after about twenty to twenty five days. They will often follow their parents around for a short period after this, sometimes for several weeks. Hey Buddy!, I found this information for you: "The Downy Woodpecker Bird". 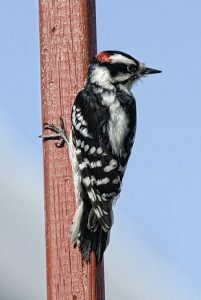 Here is the website link: http://backyardbirdingblog.com/downy-woodpecker-bird/. Thank you.